My father was a Satchmo fan - so when it came to music lessons, my older brothers and I were dragged along to the local brass band. I started on the baritone at age 8 but never really felt comfortable with it, and recall the tearful moment when I accepted that me and Santa Lucia on the baritone were never going to coalesce. I studied nursing straight out of school, and enrolled in a BA majoring in literature and professional writing. But my health crashed and burned in my early 20s, and I was diagnosed with severe rheumatoid arthritis. Told to expect the wheelchair by 26, the desire to write became more urgent. I started attending poetry and spoken word gigs - everything from staid ‘literary gatherings’ to strutting around shouting between punk band sets while people tossed empty VB cans on the stage. Over the next 25 years I published a truckload of poetry and some short fiction in literary magazines and attended readings all over the place. ‘Performance poetry’ gained traction in the 1980s, and I was active when poetry slams became popular in the 90s, winning early versions of The Slam’ in St Kilda and in Texas. But the competitive ethos, as with the ‘Idol’ model, just didn’t float my boat, although I did enjoy performing. The RA caused damage to my hands that made playing stringed instruments impossible. Had that not been the case I expect I would have given guitar a good shot. But I did still sing a bit, in a variety of (mostly forgettable) incarnations ranging from punk to folk to spoken word. In the early 90s I abandoned Melbourne, then met and married my partner, Kim, in northern NSW. For a time we both performed with the Nimbin poets, as well as solo and as a duo, and we toured the Midwest of the USA with the ‘Ozpoets’ performance troupe. In the mid-90s we moved to Brisbane and received a grant to tour our collaborative poetry and music show, ‘Fit of Passion’ in regional Queensland, and publish a book of the poems. We later took the show to other capital cities, appearing at poetry and literary festivals. A health setback around 2000 saw me abandoning performance altogether. My singing voice had become as weak as my body. After a few more years, barely walking and unable to perform most routine tasks, I feared a ‘downhill all the way from here’ scenario. But there was hope in new treatments becoming available, and by 2004 I was able to start on one. Amazingly, within a month, the RA symptoms had lessened by 80%. My recovery from years of disability and inactivity was long and arduous and involved many hours in the gym, but I still think of it as a medical miracle, and I am daily grateful for the ability to do everyday activities. By 2006, I was singing again, and playing bush bass in a hillbilly trio, Cathouse Creek, that gigged around Brisbane for the next 5 years. My last (6th) poetry collection, My Arthritic Heart, was published here in Brisbane in 2007 by the late John Knight at PostPressed. My writing aspirations remain but at this point the bottom-drawer projects are in fiction and family history, rather than poetry. Illawarra Folk festival brought a crack group of autoharpers over from the USA in 2012 and I learned a lot over the 3 days of Folk School. In 2013 I was gifted with a custom harp, made by renowned luthier George Orthey, which improved the sound of my playing almost as much as the instruction! I’m not overly ambitious; just being able to play the rhythm is great – though I am starting to try more melody playing. I have pretty gnarly-looking hands, and every once in a while I'll meet a ‘harper who wants to tell me my hand positions are all wrong and I should do X or Y. But if there's one thing I've learned from the autoharp community, there is no ‘right’ way. The autoharp is culturally tied to old time, bluegrass and gospel music, and Kim's taking up of the tenor banjo cemented us in this direction. 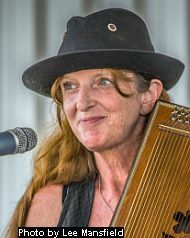 I play the autoharp upright, which is known as ‘Appalachian Style’, as pioneered by Maybelle Carter, and sometimes use a rather naughty hillbilly alter-ego, Mary-Raelene Finstelmocker. As SWAMPFISH, we mix up originals with anything else we like, from Leonard Cohen to Hank Williams. We have just released a CD, Homeward Dove, available soon at a gig near you!